When I came to New York to look for my first job long ago, my father gave me a piece of advice: take an offer that intimidates you. I’ve used that advice ever since to make business decisions, but along the way, I’ve learned that those words of wisdom live snuggled up against a few more: don’t bite off more than you can chew. The project I’m about to describe, the largest faux wood graining job I’ve ever done, walked the line between those two pieces of advice. 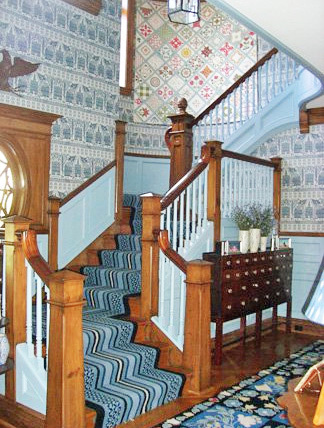 The job was in a house on Long Island, about an hour’s drive from Manhattan. Here’s a Before photo. 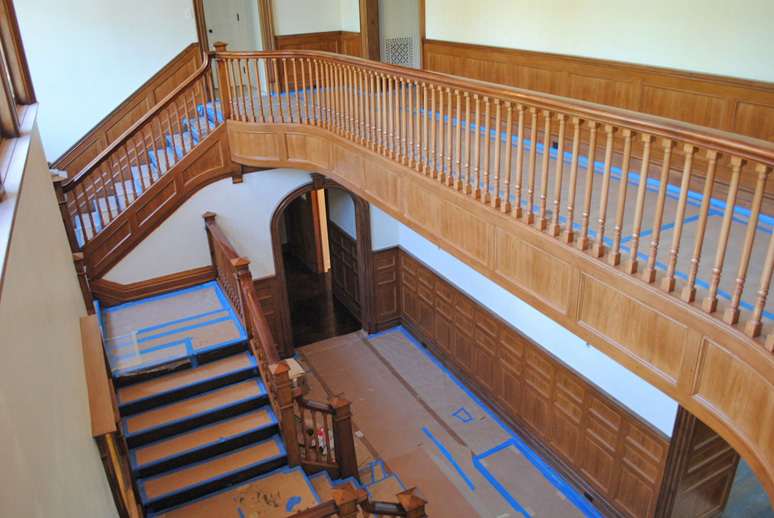 All of the wood that’s painted blue — the panels, the spindles, the little bits and pieces — was to be painted to match the existing oak, which you can see above. Here’s the After shot. The designer stripped the old wallpaper before we began. 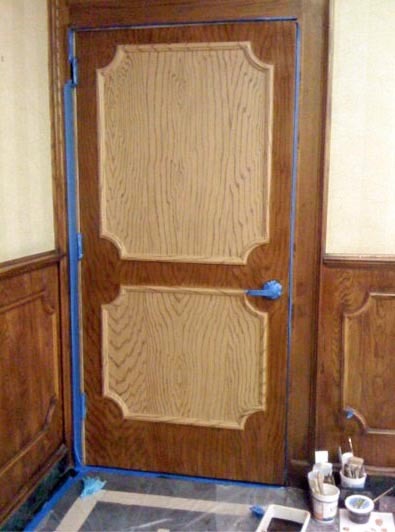 Base painters painted the blue wood to light brown, the correct base color for oak. Here it is from a different perspective. Again, a Before shot. 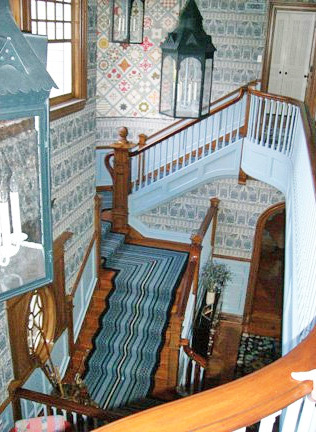 Oh, did I mention there was an upstairs to do as well? 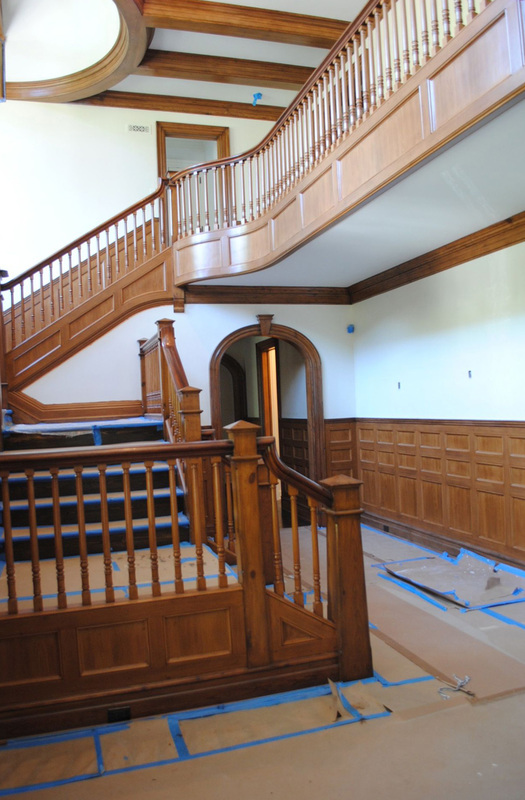 The After shot, from a slightly different perspective so you can see both the upstairs and downstairs paneling. The thought of doing such a huge job pulled my stomach into a knot. If I underestimated the time needed to complete it, I would eat the cost. 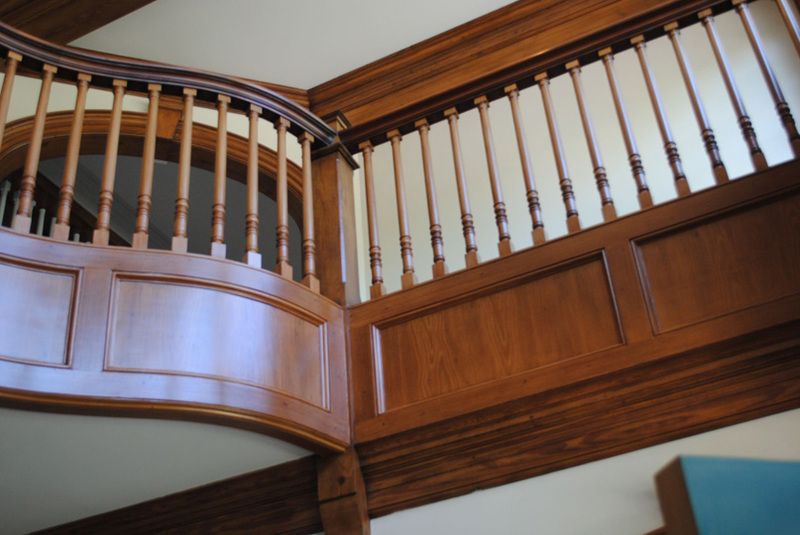 The wood we were matching was integrated into the structure of the staircase and the room, so if we didn’t match it exactly, there was no place to hide. Plus there was all that driving to get there. Still, I wanted to take the job. It was a great test of skill, plus a real showcase for the designer, whom I’d worked with for ten years. 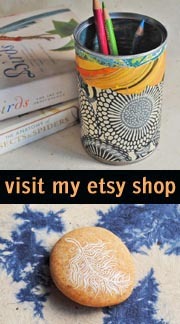 Besides, I wanted to know for sure that I could do a big project like this. Here’s a close up of the completed painted wood. 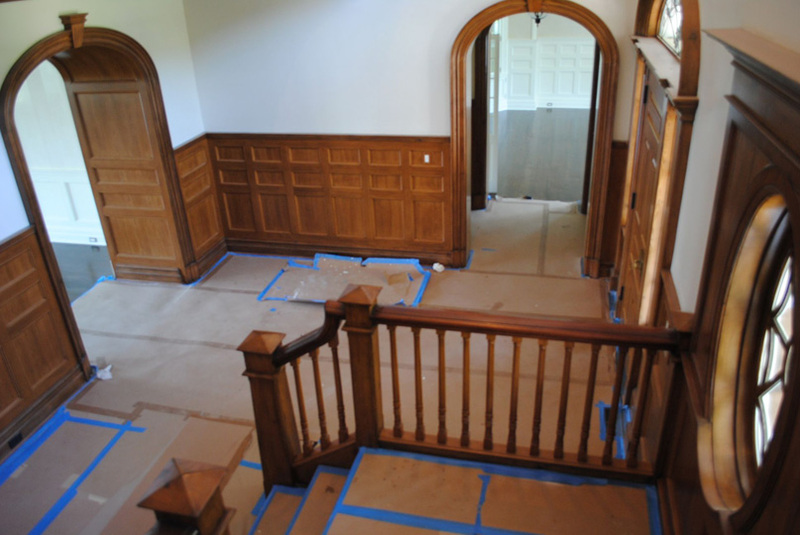 The vertical posts are real oak, as is the chair rail and the 2-inch tall base board running along the floor. The finish on the panels, stiles and rails required three coats of glaze, two layers of detail work and a final coat of satin varnish. Here’s another shot of both floors. 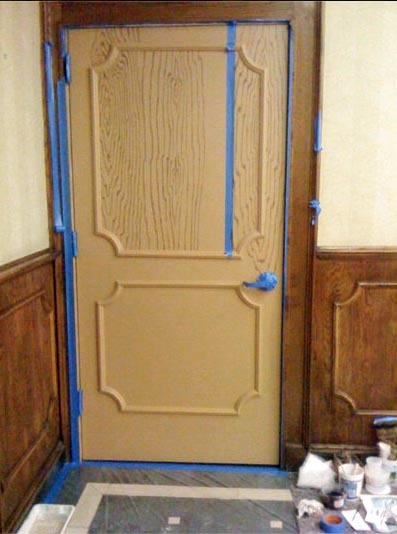 About 90% of what you see is painted oak. It took three of us four weeks to complete everything. Actually, one artist spent the entire four weeks on the 150 spindles, applying three coats of glaze and then the final coat of varnish. I’m surprised she’s still speaking to me! Big jobs like this move faster and faster as the days pass, as the techniques and routine of the process become second nature. I was counting on that, and we finished two days ahead of schedule. 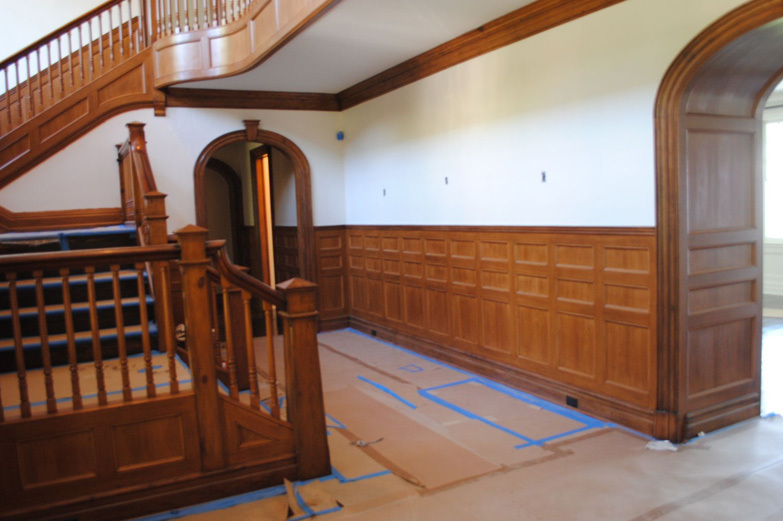 Here’s a lower view, also showing the faux oak curved doorway into the living room. 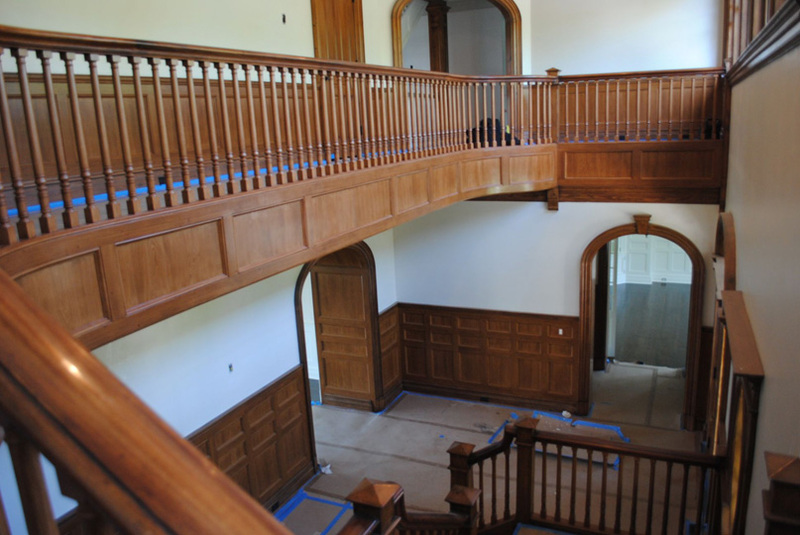 This is shot from the staircase, looking toward the living room on the left and straight ahead to the dining room. 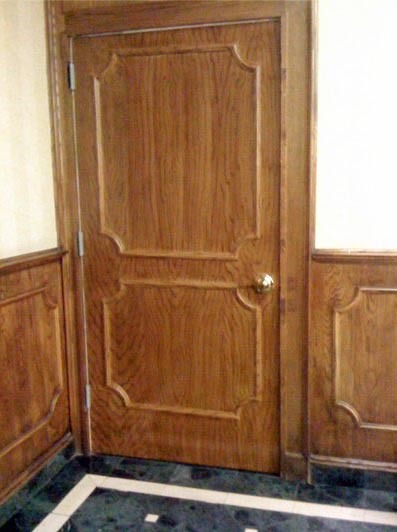 On the right is the front door, which we also painted as oak. And here’s the rest of the second floor, also painted. 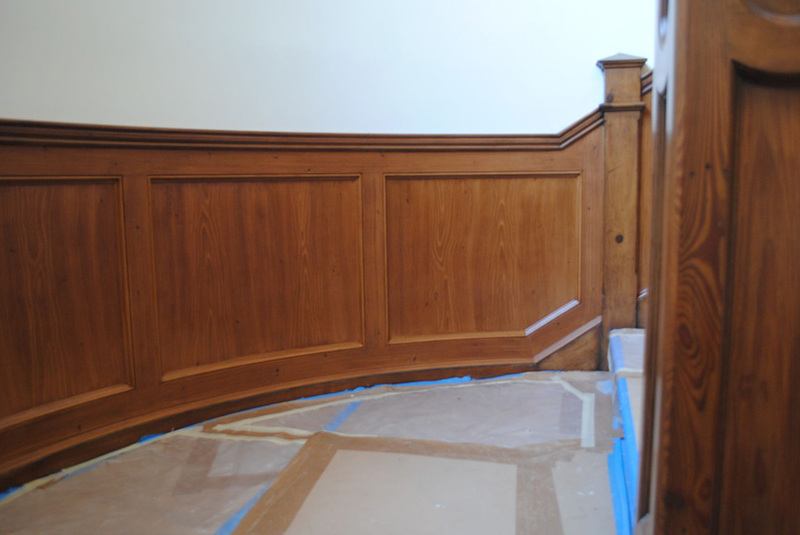 This is a close up of painted panels with the first floor’s real oak crown molding below. 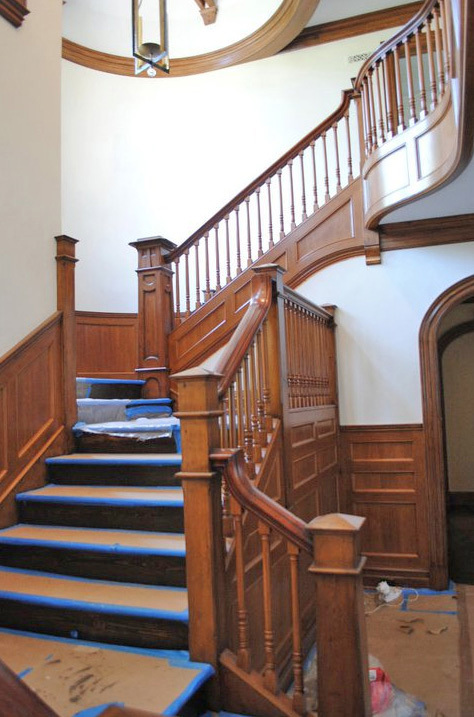 The staircase’s hand rail was real mahogany. The hardest part of the job, the part that came closest to biting off more than I could chew, came out of left field. It wasn’t the painting, it was the driving. It took much longer to travel back and forth than anticipated, which created 10- to 11-hour long work days. Not good when your job is a physical one. Still, it was worth it, knowing for sure that I could take on a project of this size and scope. 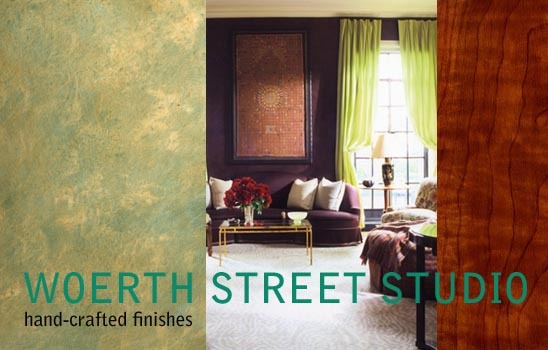 And when the designer came to see it when we were done, he couldn’t tell what was real and what was painted. Success!